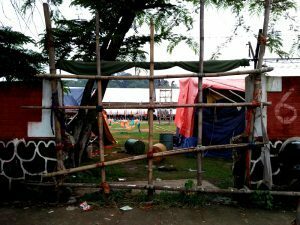 A day after Assam BJP claimed that the party has reconstructed a wall of Veterinary Science College playground atKhanaparainGuwahati, which was broken to make arrangement for the entry of Prime Minister Narendra Modi in February, 2014, a Northeast Now investigation has exposed the duplicity and doublespeak of the party over the playground. State BJP treasurer Rajkumar Sharma on Friday alleged that the Assam Agriculture University (AAU) authority had given false information regarding the playground in its RTI reply. “… though a part of the wall of the playground complex was broken to make arrangement for the entry of PM Narendra Modi in February, 2014, we have reconstructed that wall,” Sharma had claimed. Contrary to Sharma’s claim, when this correspondent visited the playground on Saturday it was found that the part of the compound wall, which was broken during Prime Minister Modi’s visit in 2014, is yet to be repaired. Instead of repairing the wall, a bamboo fencing has been placed at the broken portion of it. While in another broken part of the wall, grill fencings have been used to protect the playground. Ranjeet Neog, Associate Director of Students Welfare (ADSW) of the AAU, in a reply to an RTI application, held the BJP and Kamrup (Metro) district administration responsible for destruction of the playground. Neog had informed that the Circle Officer of Dispur Revenue Circle in February 2014 ordered the breaking of the boundary wall of the sports complex at several places to arrange law and order during a public meeting addressed by Modibefore the last Lok Sabha election. “No official of AAU authorized any organisation to demolish the walls and no organisation paid any compensation to AAU,” Neog had said, adding that efforts were on to pursue the BJP to repair the walls at the earliest. Similarly, the concrete blocks laid in several places on the western part of the play ground for construction of a temporary helipad for smooth landing of VVIPs has not been removed up till now. 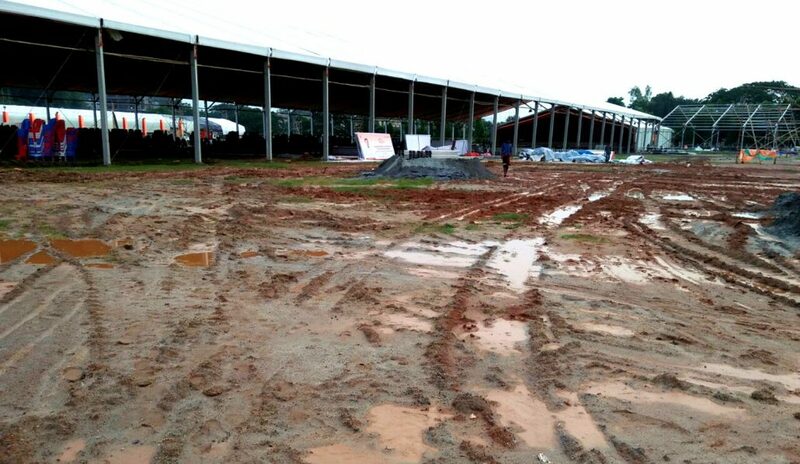 The AAU official said the Kamrup (Metro) district administration laid 91,130 numbers of concrete blocks in several places on the western part of the play ground for construction of a temporary helipad for smooth landing of VVIPs. 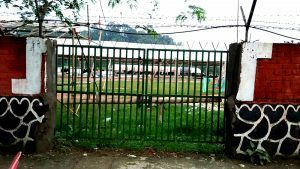 Interestingly, despite several organisation including AASU, AJYCP, KMSS and Congress as well as the Ranji players have raised voice against the alleged destruction of the playground and opposed non-sporting activities on it, Assam government has planned to organise a mega programme on the ground on June 18.